The 1835 general election had seen Robert Peel's Conservative Party form a minority government which lasted just two months before the larger Whig party replaced them. This kind of political instability led to another general election being called two years later, essentially as a repeat of the previous contest. Peel duelled with the Whig leader, the Viscount Melbourne once more in 1837, an election which saw little change nor events of note, aside from the resulting government being the first to be formed under the new Queen Victoria. In Ireland, the Repeal Association remained allied to the Whigs, under whose banner Daniel O'Connell's men continued to stand. 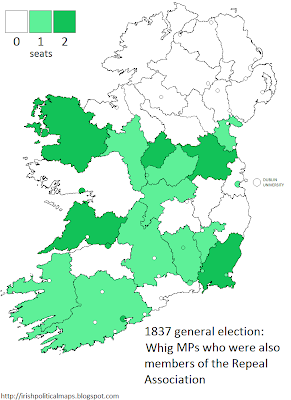 The results in Ireland did not follow the wider trend in the UK, where the Conservatives took 41 seats from the Whigs and came closer to beating them. 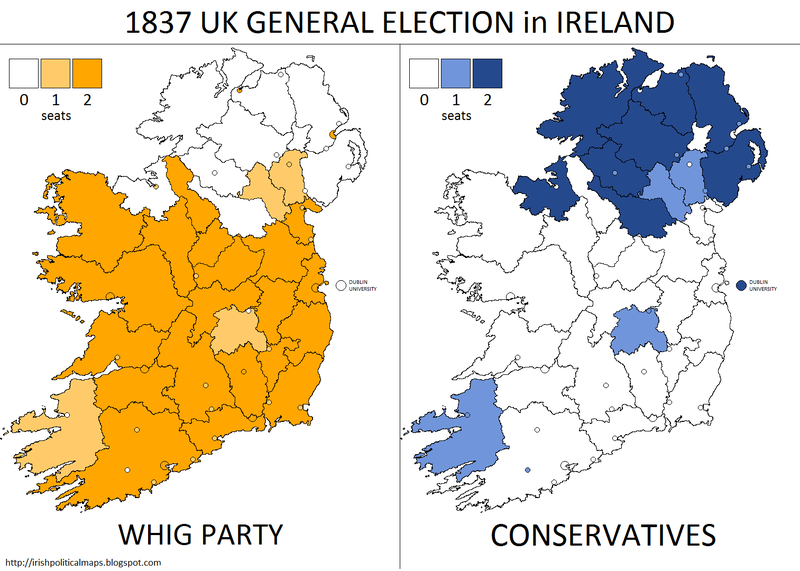 In Ireland, the Whigs comfortably remained the larger party, with 74 MPs to the Conservatives' 32. 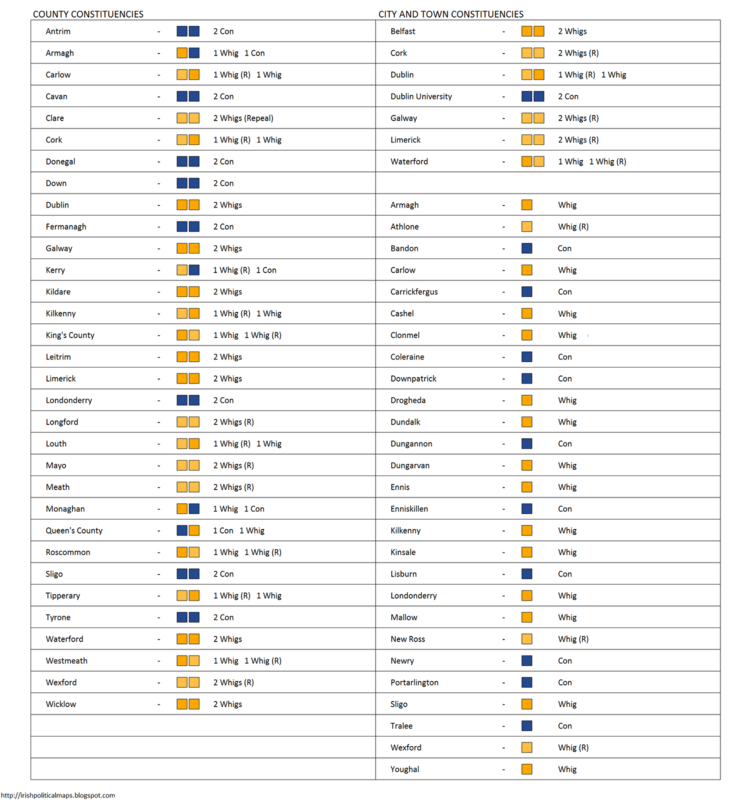 Of the 74 elected Whigs, 34 were Repeal members. Compared to the previous election, there were some notable shifts in the Irish vote. Kerry leaned Conservative, with one of its MPs and the MP for Tralee both coming from Peel's party. This was a marked contrast to the dominance of Repeal candidates in that county two years ago. 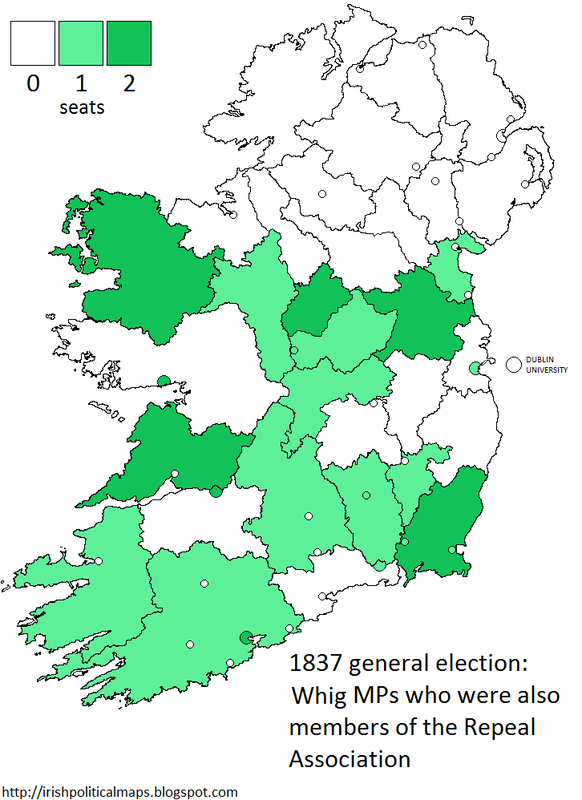 Conversely, the Conservative support in Carlow and Queen's County (Laois) lessened signifcantly as the Whigs made their first gains there since 1832. Carlow switched completely from Conservative to Whig, with a Repeal candidate being elected, while Queen's County retained just one of their Conservative MPs. Further north, Longford also switched from two Conservative MPs to two Whig (Repeal) MPs. The situation in Ulster was likewise shifted from previous trends. Both Antrim and Down each had two Conservative candidates running unopposed, eliminating the Whig support which could formerly be seen in those areas and rendering Ulster a nearly total Conservative province. 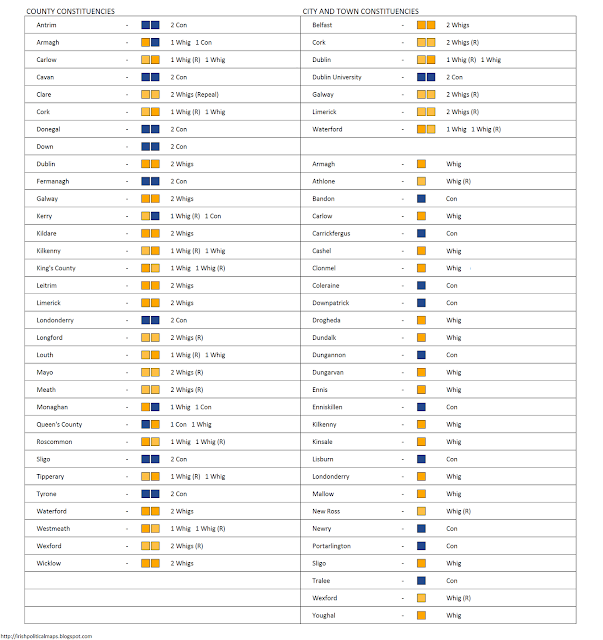 Only Monaghan and Armagh elected a Whig MP each, with Belfast and Londonderry City (Derry) also bucking the trend. Overall, the Whigs claimed another election victory, with Melbourne remaining as Prime Minister. The Conservatives were closing the gap however, and the next election would see them put an end to the Whig majority - an end aided in part by the cessation of the alliance with the Repeal Association.